How hard -- I wondered to myself -- could it be to make crackers yourself? Not very hard is the answer. Not very hard at all. They're quick to roll out and bake, they cost next to nothing, they're infinitely customizable, and they're as wholesome as the flour you use to make them. So now I make them all the time. Especially because the kids favor cheese and crackers or crackers and dip for their school lunches. On Sunday, I make some crackers and buy a nice piece of brie, and then we're basically set for the week: a piece of cheese, a handful of crackers, a knife, a napkin, an apple, and a cookie. Lunch. Whisk together the flour and salt, then stir in the water and olive oil. Using a mixer with a dough hook attachment, mix the dough at medium speed for about 5 minutes until it comes together into a nice-looking ball: it will look shaggy and unpromising at first, and then suddenly smooth and suave. If you don't have a stand mixer, you can mix and knead the dough by hand, adding a bit more flour or water if the dough seems too sticky or too dry. Now shape the dough into a ball, put it back in its bowl, coat it lightly with olive oil, cover it with plastic wrap or a shower cap, and leave it alone for anywhere from a half an hour to an hour. Heat the oven to 425. Divide your rested dough in half, and, on the back of a heavy and heavily floured rimmed baking pan (you want one that's 12- by 17- inches or so, and one that has a rim all the way around, so that, when you flip it over, it's nice solid), roll out half the dough out until it covers the pan more or less from edge to edge. It should be quite thin. Trim off any overhang and brush off any extra flour. Now brush the dough with the salt water, prick it all over with a fork (so the crackers don't balloon up in the oven), and sprinkle with the toppings of your choice. Holding your hand high up while sprinkling will give you the most even coverage, while holding your hand low will give you dense and isolated reservoirs of topping. Now use a pizza cutter or a large knife to score the dough into the cracker size of your choice. If the dough bunches up anywhere while you're cutting it, just pull it straight again, and don't worry about making sure the crackers are separated: they'll break apart just fine after baking. 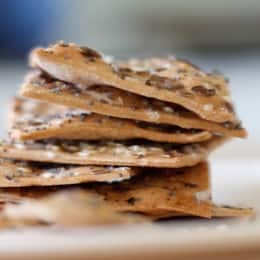 Bake the crackers for 5 to 10 minutes, until they are nice and golden and browning slightly on the edges and looking very baked. Watch them very carefully beyond the five minute mark: a minute is all it takes to separate slightly underdone crackers from slightly burned ones. Remove the baked crackers to a cooling rack, where they will crisp up nicely. (I don't want this to sound complicated, but sometimes in the very middle of the pan, there are some crackers that are less done than their buddies on the outside, and I return these ones to the oven for another minute. Do as you see fit.). Repeat for the other half of the dough, either on a second cookie sheet or on the first one after it's cooled and you've brushed it off. After cooling, break the crackers apart and store airtight. I have tried this many times now, and my favorite flour combinations are half all purpose and half white whole wheat, or a third each white, whole wheat, and semolina or a third each spelt, white whole wheat, and all purpose. Those are ratios, not measurements, as I'm sure you grasp, unless you were too shocked by the word "spelt" to follow the rest of it. A fun alternative, if you happen to have a crank-style pasta roller, is to divide the dough into four pieces and roll each one out in the pasta roller, stopping after level 5, and proceeding with the cutting, pricking, brushing, topping etc. This is an especially nice job for a handy child.